Learn about the temperament and personality of the Chinese Shar-Pei. Discover what he's like to live with, his traits and characteristics and how he generally behaves. And look at lots of Chinese Shar-Pei photos. These unique dogs are regal, dignified, calm and confident. They are incredibly devoted to their families and are standoffish with strangers. They make excellent watch dogs and are protective of their home and loved ones. They need to be socialized early on or they can become aggressive. They generally do well with other pets, but some Shar Peis are dog-aggressive. However, they usually do well with children. They can often be stubborn. They are remarkably easy to housetrain and some of them start asking to go outside as early as eight weeks old. 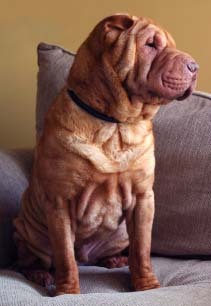 Shar Peis bond quickly with their new family and they thrive on attention and interaction. They need daily exercise but care should be taken that they don't spend too much time in the sun, as they can overheat. They do snore and snort, and get slobbery after they eat. But this rarely matters to Shar Pei parents, as the dogs are so affectionate and devoted, the slobber becomes a small price to pay. The Chinese Shar-Pei sheds a fair amount of hair. You'll find hair stuck to your couch, carpets, clothes and everything else in your home.